Pafos Elite Villas are a sophisticated new concept in holiday rental villas. Modern design using the three elements of natural stone, water and sun are combined right in this Mediterranean paradise. This ensures that you have a unique holiday to remember and want to return to. Each of the 10 villas are uniquely designed and have their own private swimming pools and beautifully designed gardens , where you and your family or friends can enjoy breath taking sunset views across the Bay, or use the outside kitchen and BBQ for that wonderful Al Fresco cooking experience. All villas have top quality sun loungers in their own private garden and sun decks next you each private pool. For holidays in the cooler winter months we have 5 villas with the option of pool heating and inside the beautifully designed living space there are fully functioning open fireplaces to keep you warm and enjoy romantic cosy evenings by the fire whilst enjoying the sea views from all of our villas. All villas are fully equipped with state of art Italian designer fully fitted kitchens which complement the Italian designer interiors of all of our villas. Top brand electrical appliances complete the facilities. 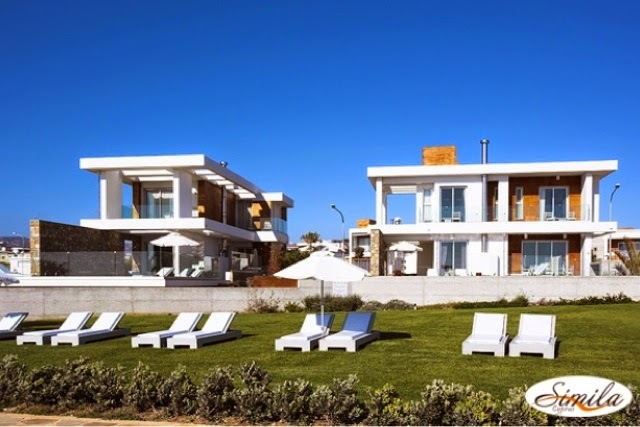 Pafos Elite Villas are located in unspoilt natural coastal surroundings , with direct access to the sea and the sand beach is only 50 metres away, which is one of Cyprus European Blue Flag awarded beaches. Next to the villas is the World Heritage UNESCO site and nature reserve and the coastal path leads directly to Paphos Harbour and famous Paphos Castle. The brand new Paphos Kings shopping Mall is just 7 minutes walk away , with top quality brand stores such as Marks & Spencers , Costa Coffee and many designer stores and food hall restaurants, including a large supermarket. All villas have satellite TV with all Sky channels, Wifi Internet and there is a private beach bar and additional sun loungers in the main sea front gardens. Whether you want a quiet romantic hide away, or a large villa for sharing with friends , Pafos Elite Villas have something for everyone. England to Ukraine to Cyprus !